Nashville Pink Bridal Show this Sunday! Posted in: Bridal Shows and Events. Tagged: Bridal Show, Enchanted Florist, Nashville Bridal Show, Nashville Convention Center, Wedding Flowers. Busy, busy weekend awaits! Our team is spending the next few days putting the final touches on our booth display for the Nashville Pink Bridal show and we can’t be more excited! The show takes place this Sunday, January 8th from 11am-4pm at the Nashville Convention Center and with lots of wedding inspiration, trends and local vendors, this is one bridal show not to be missed. 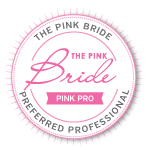 For more information on what to expect, head over to the Pink Book Blog to find out what the Pink Ladies have in store for the bridal show or visit their show site to purchase and ticket online (and save $2). As for the Enchanted Florist booth, we are changing things up a bit this year. Keeping in mind our urban chic theme, we are playing around with a favorite color of ours for weddings… white! Set up will start mid-day on Saturday so be sure to check out my facebook page for updates on the progress. As for show day, we will be scheduling follow-up appointments for couples stopping by the booth so have you calendar on hand. We can also take retainers to book your date, ensuring you have the most beautiful flowers on wedding day! Can’t wait to meet with all the happy couples and talk weddings… See you Sunday!